Positional and blocking games are the most frequent of all types. Each side battles for position, trying to restrict the other's movement whilst	establishing a position of overwhelming advantage. White wins the opening move and must play 2:1. He elects to try and make his 5 point by playing 6-5, 13-11. So long as Black does not hit his blot he has a very high probability of covering on his next turn. Any 3 from 8, any 6 from 1 and any 1 from 6 will cover. Black throws 5:4. Nothing very constructive can be done with this throw so he immediately decides to hit the blot, moving 1-5, and brings down one builder 12-17 with the 5. This is a reverse for White, though not serious. 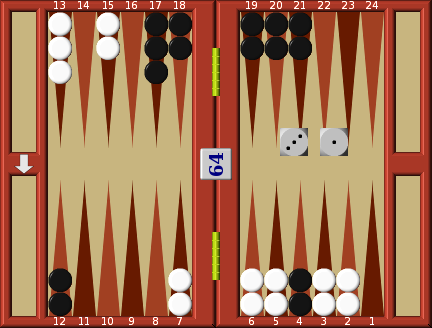 Black still have an open home board so there will be no difficulty about	re­entry, but Black is threatening to gain control of the white 5 point if he throws another 4 on his next turn; or failing that, any 6 will now enable	him to hit the white blot on 11. 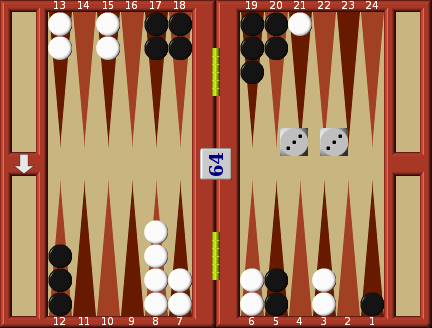 White throws 3:2, and is faced with a choice very common in backgammon: does he re-enter on 2 and drive Black off his 5 point by playing 11-5? Or does he re-enter on 3 and cover the blot on 11 by moving the 2 from 13? At the start of the game when White dropped a blot on 5, Black had 15 dice combinations that would enable him to hit the blot from 1. Now if White hits the blot, Black will have 22 chances of hitting the new blot all the 5s on re-entry, and all the 4s from 1), and two of the chances 6:5 and 5:6 would enable him additionally to hit the white blot on 11. White therefore decides to risk Black making his 5 point, re-enters on 3, and covers his blot 11. Black throws 6:3. From his point of view this is a most unsatisfactory throw. He cannot move the man on 5, or cover it. He decides to enhance his blockade-building position moving 12-15, leaving his blot 7 points away from the white man on 22. But where does he play the problem 6? If he plays into his own bar point White can hit him from 24 or 22, making it very vulnerable. 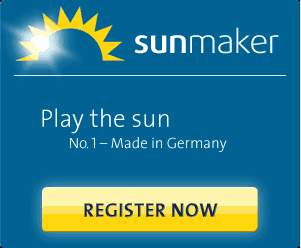 Equally the alternative of playing into the White bar point is not very attractive. White is now in a position where he has an excellent chance of hitting and covering on 7 or 5. In the end Black decides to play 1-7, hoping that it will prove to be the lesser of the two evils, and that if it is hit it only has to go backwards a few spaces. If he put the	blot into his own bar point it would go a long way back, and he would then have three men back instead of only 2. White studying the board notes that Black has made little progress in building any blockade, but is threatening either to escape with his runners, or to make the white bar point on his next turn. He throws his dice and gets 6:4. He ignores the opportunity to make the black bar point, and uses his move in a policy of trying to trap the black runners by playing 13-7, 11-7 to make his own bar point, and places the black blot on the bar. So long as Black has a totally open board and virtually no blockade, White does not mind risking the blot on 11. Far more important at this stage is to build up his	own blockade. Black throws 2:1. Another throw he could well have done without! He decides to re-enter on 1 and move onto 3. Any other move would force him to expose yet another blot to White, and he certainly does not want to reduce his blockade-making chances by playing a safe move 15-17. White throws 5:2, quite useless for extending his blockade, so the only move worth considering is to hit the black blot on 15, moving 22-15, thus further reducing Black's blockade-making chances, and sending a third man back to the starting position. Black throws 2:1, re-enters on 1 and moves secure the white 5 point. Black now quite rightly feels that his runners are secure on a point from which it should not be difficult for them to escape when the time is right. By leaving a man on the 1 point he also makes it dangerous for White to drop a blot behind the 5 point. Though he has made no progress in building his own blockade he does hold a good position in white home board. If Black attempts to run he has a very high chance of being driven back as long as White holds 13 and 15. 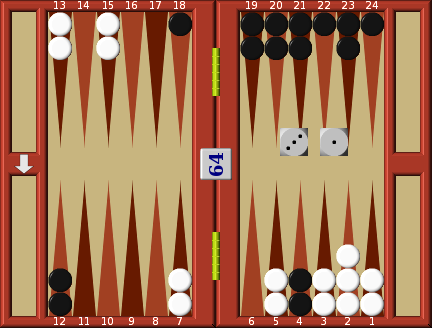 If his blot on 11 is hit it may well be the cause of Black losing control of White's vital 5 point. There are no problems of re-entry so this might well end up a satisfactory sacrifice. If Black attempts to drop a blot into his own home the White man on Bi has an excellent chance of hitting 1. Black throws 1:1 and immediately plays two men 17-18 two men 19-20. In one move Black has revolutionised his position, secured control of his 4 most important points and unlike White, started to close up his home board. For the first time in this game Black feels that things are beginning to go his away. 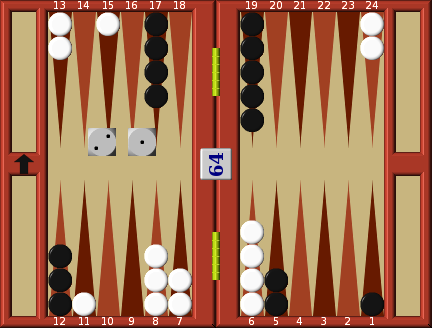 White now decides that if it is possible he must move or cover his blot on 11, and escape with his runner before Black can extend his blockade any further. White throws and gets 3:3. So he moves 11-8 to get the blot safe, 24-21 to prepare his runner for escape, and two men 6-3 to start closing his board and	to provide a safe landing point for his home-coming men. Black throws 4:2. It would be suicide to run with one of his distant men with White waiting to pounce from 13 and 15. The only logical move is to play 17-21, 19-21 to make the point, putting the white man on the bar, and closing up his home board a little further. White throws 6:4, fails to re-enter his man and forfeits his move. Black throws 5:4. He constructs a 5 point blockade by moving 13-18, and then starts his runner on the way home moving 1-5. White throws 6:5 and again fails to re-enter his man. Black, feeling that the wheel of fortune is really running his way doubles White. White accepts. He reasons that with 3 points open to him he must surely be able to re-enter his man in the near future and Black is not going to find it easy to get his men home past the two points White holds (13 and 11). Black now throws 6:5. He has two ways to play this. He could risk everything to try and complete a prime, by moving the two men on 13 to 18 and 19, giving him two builders that he hopes will complete the prime on the next move. This is, however, a very risky move. Firstly only 5:4 or 4:5 will enable him to complete the prime (2 chances out of 36). Secondly if White re-enters and escapes it is going to be very difficult to hit the white blot once he gives up the 12 point. Thirdly if he has no safe landing point on 12 it is going to be very difficult indeed to bring his last three men home without being hit. Black wisely decides to play 5-16. If White gets the lucky 3:6 or 6:3 (2 chances in 36) he will	virtually have lost the game. If White gets one of the other 34 permutations then Black will be able to complete a prime with any 4 (11 chances in 36) or with 2:2 or with 6:5 or 5:6 from 5. White throws 6:2, re-enters his man on 23 and moves another man 8-2. So far in the game we have seen Black, after an adverse start, construct an excellent blockade and he is now close to trapping the white runner behind a prime. White, having failed to secure a good blocking position, changed his tactics to play a positional game that makes it difficult for Black to escape with his last two men on 5. Nevertheless White is in a very difficult situation: if he can escape with his runner he may be in a winning position; but if it is trapped behind a prime he will certainly lose. Not to move from 12. This point is still vital to help his last 2 men escape. Not to move from 16. This blot is 7 points away from the white man on 23, and so can only be hit by 6:1 (2 chances in 36). Black still hopes to be able to cover the blot and complete his prime. He finally decides to run with one man from 5-14. If White should get a 1 on his next turn he can hit the black man on 14, but cannot, at the same time, move his blot 23-22. White must do this if he is to have any hope of escaping with a 6. Therefore, Black reasons, White will not dare to hit	his blot on 14. 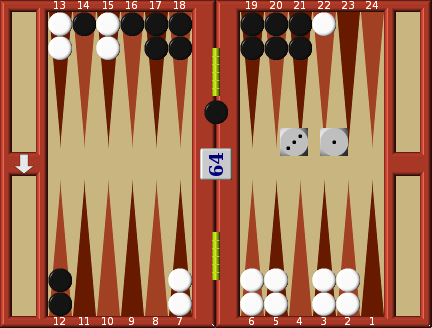 In addition, by placing his blot on 14, he increase his chances of covering the blot on 16 with his next turn. 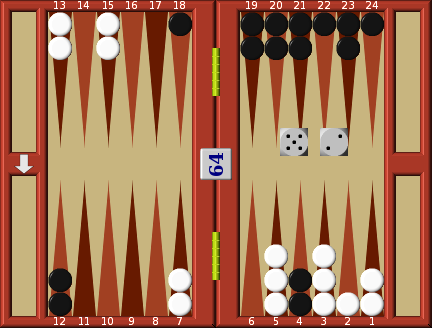 Finally if White does make the error of hitting his blot on 14, it is unlikely that he will also be able to cover the blot on 2, giving Black a shot at it during re-entry. White throws 6:3. He certainly did not want that combination. There is nothing he can do with his trapped runner and White knows that his situation is now desperate. Any combination with a 4 or 2 or 6:5 will enable Black to complete his prime. White's situation is so serious that he must take any risk to try and save the position. 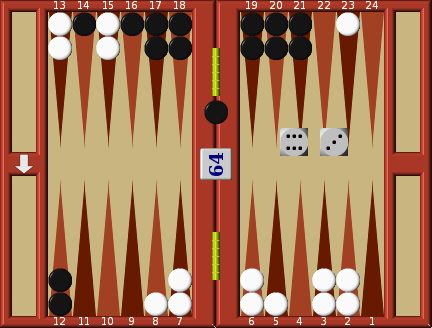 He plays 8-2 to cover his blot with the 6 and 8-5 to hit the black blot and put it on the bar in a desperate attempt to stop Black making his prime. Black throws 6:2 and cannot re-enter. White's desperate action as given him a brief breathing space. White throws 3:1. He covers his blot on 5 by moving	from 8. The problem is the 1. At first he is tempted to hit the blot on 14; with four points closed in his home board Black's chances of re-entering both men fall to a mere 11%. Strong though the temptation is, White resists it and decides he must play 23-22 so that his trapped man can escape as soon as he throws a 6. In any other circumstances he would have put two black men on the bar. Black throws 4:3. The 4 he so badly wanted to complete his prime must be wasted re-entering his man on 4. What should he now do with the 3? With two	blots exposed he must move one of them, but which? There are 11 dice permutations that contain a 6 with which to hit the man on 15. There are also 11 dice permutations that contain a 1 to enable the blot on 14 to be hit. So from the point of view of probability there is nothing to choose between the two blots. Therefore he decides that he must leave a blot in a position, where, if it is not hit, it will most benefit his position on the next turn. He moves 14-17, still hoping to make his prime, either by covering the blot on 16, or by playing 6:5, 16-22, 17-22. White throws 6:3. A perfect throw, he hits the black blot and moves onto 13. Note how White does not hit the blot on 4 from 7. Black's 5 point blockade is too dangerous to leave a blot exposed in his home board. A major reverse for Black. Black throws 3:1, enters with the 1 and moves the same man on 1-4 to make the point. Black's blockade is now of no use unless he can hit a white blot, so now he changes his tactics to playing a positional game, and will not therefore move his men from 12 or 4. 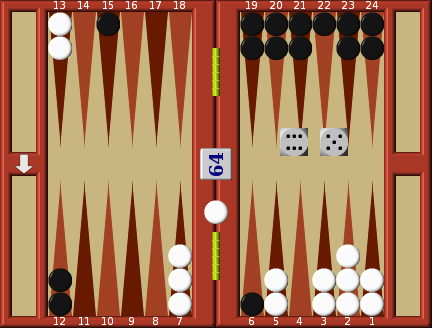 Until he can hit White all moves will be	played into his home board. White's turn to play. Flushed with the success of the escape of his runner and the dramatic improvement in his position he re-doubles Black, hoping that	after such a reverse Black will instantly resign. Instead Black instantly accepts. He in turn reasons that holding the 4 point he is in no real danger of being gammoned, and that the gap between 13 and 7 should with any luck give him a good chance to hit a blot when White brings his men home. White, by now wishing that he had not been so hasty with the re-double throws his dice and gets 5:3, moving 13-5. Black throws and gets 5:2, and moves 17-22, 17-19. He is intent on closing up his board as fast as possible so that when he does hit a white blot re-entry will be as difficult as possible. White throws 4:1. This is where the gap he has to cross becomes so dangerous; he cannot bring in another man without exposing a blot to Black, so he	decides to play safe moving 5-1, 2-1. Black throws 5:4 and moves 17-22, 19-23. White throws 3:1. He does not dare move his distant men, so is again forced to play safe, moving 6-3, 6-5. Both sides are playing a cat-and-mouse game, each hoping that the other will be forced to make a run for home first, leaving a blot on the way. The position is moving steadily in Black's favour. White has already been forced to open up a point in his home board, whereas Black is still closing his up. Black throws 5:2 and plays 18-23, 22-24. He does not want to move his remaining man on 18; he is keeping it outside his home board so that if he should throw a 6 he will not have to move one of his distant men, and thereby expose a blot. White again throws 3:1 and plays safe 5-2, 3-2. Black throws 6:2, he moves the 6 18-24 and the 2 4-6. He selects this move for the 2 because White has no spare builders close at hand with which to hit	and point him, and because with these two men split, his chances of hitting a white blot, if one is exposed, are greatly enhanced. White throws a 6:2. The choice is now becoming very difficult. He could play safe by playing from 7 to 1 and 5. The thing he dislikes about this move is	that it increases the gap that his last four men must cross, and he can be quite sure that whatever happens Black will keep his men waiting for the white men to cross that large open space. The alternative would be to bring home one of his most distant men playing 15-7, risking being hit whilst Black has a blot exposed in his home board and no builders waiting to cover it. 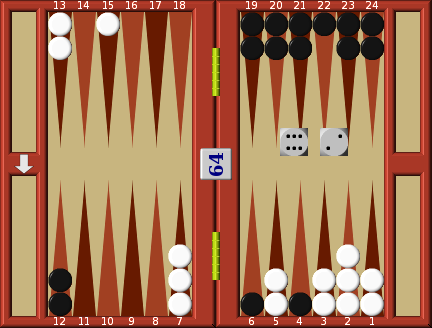 If Black's home board had been closed he would have played safe, but with a blot exposed no decides to risk running. Black throws 6:5, and hits the white blot by moving 4-15. White throws 5:2 and fails to re-enter. Black now re-doubles White to 8. This time White refuses. He judges that Black will either move or cover the blot and that with only one point open it will not be easy to re-enter and escape without Black hitting him again. He decides that he would rather pay up 4 than risk losing 8, so the game ends. This is a good example of a blocking/positional game. Each side struggles to construct a dominant blockade and when that fails, each side switches to a positional game. 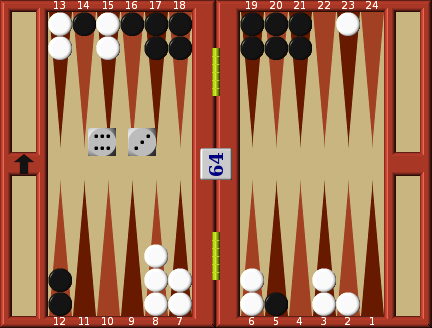 The major error of the game was made by White, when he re-doubled Black too early. White had control of the doubling cube at that stage, and should not have used it until he was in a more secure position. If he had retained control of the cube Black could not have forced him to resign with the re-double to 8, and though White's position was adverse he might well have hit the blot and won the game. Possession of the doubling cube is very important, and you should not lightly surrender that right. As long as you hold it no one can force you to resign when the going becomes a little tough; but give up control and you give to your opponent the right to use the psychological advantage of the re-double. In backgammon there are many situations where experts will totally fail to agree, and probably the offering, accepting or refusal of the double or re-double will cause more disagreement than anything else. In this example we showed White offering a double prematurely. Yet against another opponent it might have been the correct thing to do. The cube is a club, and should be used as such. It is often possible to force an opponent to retire by threatening or bluffing him with a double. You need to study the psychology of your opponent. Some crumble quickly when you double, some hesitate, some almost always accept. If you are playing an opponent who accepts most doubles, you should not double him until you are certain that the situation is almost watertight. If he	is the type who resigns easily then do not hesitate to double him the moment you judge he will resign. The whole object is to win as often as you can, and repeated wins of one point are better than a few wins and several losses of two points. Beware of the opponent who does not crumble easily, and	remember that an apparent advantage early in the game can so easily turn out to be nothing more; your lead can evaporate just as quickly as the morning	dew in the sun. A good player knows this, and he will be quick to accept the early double; having possession of the cube you can be quite sure that he	will be ruthless with the re-double if and when the game moves in his favour. When you double an opponent, do so with a self-confident and aggressive attitude; it is all part of the bluff to rattle him, to demoralise him. Listen to the comments your opponent makes. If he is complaining about his luck, his bad dice, or saying that he is off form that night, then take them as clues and use the cube more aggressively, and make comments that reinforce his feeling that he is out of luck. If he is in top self-confident form and feeling he is on a winning streak, then be more cautious, he is in a mood where he is more likely to accept. This psychological use of the cube is very important, but it is also necessary to have some guidelines by which to judge when to double, accept, refuse.